Recently I was rejected by an online journal after I had submitted a piece for consideration. After much whining and foot stomping (on my part), I passed it along to a few friends for critique and then sat down with my own scalpel. Seems that the journal in question wasn’t all that insane and the piece did indeed need a little more meat on the bones. I scraped around inside my soul and came up with more batter, perhaps even some tasty morsels that should have made the first batch. I submitted and then waited… and waited… and waited. Here is a little advice to all of the editors out there who sit behind an inbox filled with the hopes and dreams of us typing monkeys, trying our damnedest to recreate our version of Shakespeare’s plays. 1. Please do us monkeys the favor of being consistent and clear about what your submission guidelines are. We are monkeys and we get easily confused. A simple email address, format for the submission, any requirements for attachments and a deadline is all we really need. If you would like to include your standard stylebook, that would be greatly appreciated, and would most likely make your life easier. What makes us bang our heads on the keyboard and fling feces at each other is when you have three different website links going to three different sets of instructions as to how to submit to your publication. 2. We appreciate you. We realize you probably have to slog through a football field of donkey crap each day just to emerge with a golden nugget, hoping it isn’t just a polished turd. We get it. We understand that as a writer, rejection is a part of our life now and without rejection we’ll only ever create polished turds. So go ahead, reject away! However I would ask that you do the favor of at least reading a good portion of the piece before rejecting so that the standard response sent out actually applies. If I’m writing a piece on footballs, please don’t tell me that you can’t possibly use one more article on palm trees. 3. Be honest. Isn’t that what editing is all about? Don’t tell us that you’d love to take another look if you really wouldn’t. We are all adults (well, according to our birth certificates anyway), and need to handle straightforward rejection without taking it personally. If you tell me that you’d be happy to look over the rewrite, then I don’t hear from you ever again, this really isn’t any different than that crappy guy I dated in college that promised to call me after he returned from spring break and never did. I’m left bitter and you look like a liar. Come on, we’re both better than that. 4. 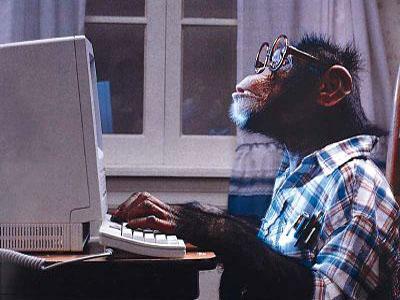 We realize that there are a lot of us monkeys out here, and we are producing a lot of polished poo, so if you’d like to give us helpful tips for revision, be sure to clearly state that these are great general tips and try not to infer that these were meant specifically for our submission. Again, we know that you’d like to let us down gently, but we’re monkeys and we need to be hit over the head. Don’t send me revision tips if you don’t really want my style of crap. 5. Finally, just be kind and courteous. I know we’re monkeys. I know we eat with our hands and have bad hygiene. But we are have feelings and thumbs and aren’t that different from you. ‘Please’, ‘thank you’ and the consideration of a response (even a standardized short but final one) would go a long way towards developing our relationship as future editor and writer, and more importantly is some of the best marketing for your publication. Thank you for the job that you do. Without editors our literary world would be a steaming cesspool of blather. You stand at the edges with your industrial sized strainer, sifting to find the gems of our madness. We love you and appreciate you. We just want to remind you that once upon a time, on the evolutionary scale, you were a monkey once too.